Reflex is a character's ability to quickly respond to actions and events going on around them. Used defensively in Reflex defenses. 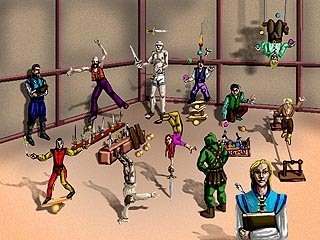 This room is filled with what at first seems to be a group of demented jugglers and acrobats. Each person is engaged in various feats of balancing and reflexive behavior, such as dancing on a row of knife blades or balancing a lit torch upon one's nose. There is a sense of intense concentration in the air. The room is mostly silent, save for the occasional muttered curse or muffled scream as someone fails in their efforts. Several professors gaze your way, waiting to begin your training. Gritting your teeth, you follow a lass who is to supervise your training. She leads you in a series of exercises that leaves you feeling clumsy and maladroit. Yet for all your worries, you find yourself casually balancing a dagger on your outstretched finger while dodging another trainee's badly juggled lit torches. At least for a moment or so. Small in size, this tent appears to not only offer a place to train, but from the furnishings it is Brebokt's home as well. A small round table sets in the center with large fluffy pillows placed around it. Brebokt himself sits studying an old yellow parchment. Several clay jars sit on a small table behind him. Brebokt smiles as he grabs one of the clay jars on the table behind him. Removing the lid, he sets the jar on the round table. Almost immediately several hundred flies take flight from their small prison and fly about the room. Brebokt begins to instruct you in the methods of sensing and controlling your body until you have caught every fly and returned the unsquished ones to the jar. With a smile Brebokt pats you on the back and says, "Next time we'll work on catching them without crushing them." The back room is falling apart along with the rest of the tavern. Dirty wooden planks atop battered crates are the only seats, besides the floor. A group of ragged S'Kra Mur throw daggers at the vermin which infest the shadows of the room. One of the seedy S'Kra Mur takes you into a corner and looks you over. Suddenly, he pulls a knife out of his belt and throws it at you! You duck just in time, and stare at the man in outrage. He smirks at you, and then begins explaining how to keep your eyes moving, constantly assessing those around you. He shows you ways to focus on your peripheral vision, so you won't be surprised from the side. You nod to yourself as you see the wisdom of his words. As you turn to leave, he throws another knife at you. This time, you dodge it with plenty of room to spare. Bright light streams through the paper screen door leading to the courtyard. Through a white birch archway, figures engage each other in a dance of blades, their weapons flashing in the light. A large sign hangs upon the northern wall. Several musical instruments are carefully laid out on a low, felt-covered table. An ancient grandmotherly Halfling woman glances up whenever anyone enters, and her gnarled fingers lovingly grasp a carved ivory flute. A lute is pushed into your hands, along with three heavy steel rings. With the rings on your fingers, playing the instrument turns out to be quite a challenge. Then a set of juggling balls are thrown at you -- literally. The end result is a reflex response coupled with a healthy paranoia of small flying objects. Seated on the floor with his legs crossed is a Gor'Tog wearing a tan buckskin coat and a jaunty green cap with a feather in it. There is a sparkle in his eye when he glances up as if he's about to have a bit of fun. The room is unfurnished except for a small oaken table with a pair of crutches leaning against it. Springing to his feet with unexpected grace, the 'Tog grabs one of the crutches leaning against the table. Without warning, he sweeps your feet out from under you, sending you tumbling to the floor. As you pull yourself back up, he suddenly pokes you in the stomach, causing you to double over. He continues to bash, trip, and prod you, seemingly at random until you find yourself expecting an attack to come from any angle at all. To your surprise, you find yourself dodging without a second thought. With a wink in your direction, he puts the crutch back where it was and sits down. This page was last modified on 1 September 2015, at 00:15.